The function of this Commission is providing aid to indigent veterans and their families who qualify for and need assistance that may not be available from other agencies. In addition, the commission works closely with other service agencies who, at times, will share cost of assistance to veterans. There are presently approximately 4,000 veterans in Livingston County. The Livingston County Veterans Assistance Commission (VAC), formed by the County Board in 1989 at the request of County veterans organizations, is operated by and for veterans. 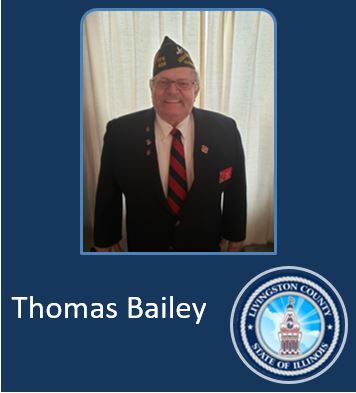 The agency is funded by County funds, pursuant to Illinois statutes, to provide aid to indigent veterans and their families who qualify for and need assistance that may not be available from other agencies. Tom Bailey has served as Superintendent of the Commission since April 2005. The Superintendent and Commission officers meet monthly with representatives of the veterans posts from throughout the County and review requests submitted from the posts. To qualify for assistance, an individual must be an honorably discharged veteran, a resident of Livingston County, and meet specific income requirements. Veterans are assisted with obtaining medical treatment at VA hospitals, pensions, compensation benefits, burial allowance, document processing, food, rent, utilities, and life skills. The agency also works closely with other service agencies who, at times, will share cost of assistance to veterans.